Brandon Jones, owner of Tyler Kung Fu & Fitness has over 34 years experience in the Chinese martial arts of Kung Fu and Tai Chi. 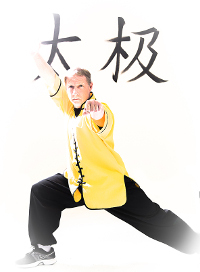 Brandon has been teaching Kung Fu and Tai Chi professionally here in Tyler since 1996 and is the Tai chi instructor for the ETMC Olympic Center and for the ETMC Cancer Institute. Jones has also worked with other area physicians, nurses, and physical therapists in providing Tai Chi for their patients. Jones is the founder of the Stranger Danger program for children. The Stranger Danger program has been used by many Tyler School District campuses and is run as a PSA throughout the school year on the TISD channel. A popular guest speaker for a variety of organizations, Brandon discusses the topics of self-defense for women and children, tai chi for seniors, and adult fitness. For two years Jones was the self-defense expert for CBS Channel 19, appearing weekly on the Live @ 5 evening show. In 1998, Tyler Kung Fu & Fitness was the first martial arts school in Tyler to offer a fitness kickboxing class, and in 2000, Jones expanded their fitness program to include circuit boxing with the state of the art CIRCUIT BOXING room. Brandon and his business partner Dr. John Cheng, M.D. are creators of the video, Tai Chi Forever; 8 Steps to Optimal Health. Tai Chi Forever is sold nationwide and is the only medically documented Tai Chi video on the market.